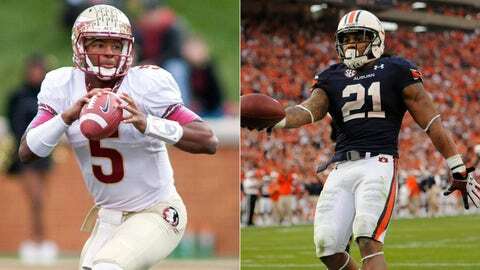 Florida State's Jameis Winston won the Heisman Trophy, while Auburn's Tre Mason finished sixth in the voting. Auburn is going to run. We know that, because regardless of how good the opposition has been and how good it has been at stopping the run, the Tigers have persisted. 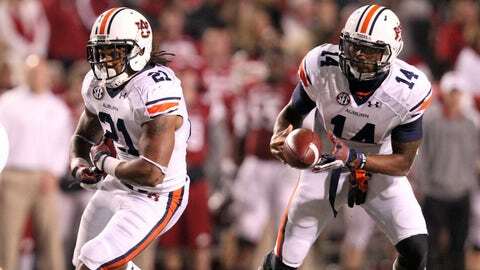 Cory McCartney breaks down the five reasons Auburn will beat Florida State in the BCS title game. They went for 296 yards on Alabama’s then-fourth-ranked rush defense and put up 545 against Missouri, which was 14th at the time. They’ll be facing a Seminoles D that overall has been strong against the run (14th) and has allowed a nation-best five TDs on the ground, but has also had its troubles in this area. Adding to the matchup problem for the Seminoles is the pace. Auburn going over 77 snaps in five games, including three of 85, is something Florida State dealt with just once (Clemson ran 86 plays in the Seminoles’ 51-14 rout). Can Florida State do what no one else has been able to accomplish and take Auburn out of its gameplan? If not, the Tigers could run their way to the SEC’s eighth straight crystal football. Who else but Jameis Winston? The Seminoles quarterback became the second straight redshirt freshman to win the Heisman Trophy, throwing for 3,820 yards and 38 TDs and running for 193 yards and four scores. He led the nation with a 190.1 efficiency rating and has been at his best against the rush with a 62 percent completion rating and eight TDs under pressure. His numbers were even more impressive vs. five or more rushers, hitting receivers at a 70.2 percent rate with 20 scores (per ESPN Stats & Info). Winston and Florida State’s ability to thrive against the rush will be critical against a Tigers D that will try to bring pressure with a deep, athletic front four in order to lighten the workload on a porous pass D (104th at 260.2 ypg). Winston will try to avoid a bit of unsavory history for Seminoles Heisman winners. The program’s last recipient, Chris Weinke in 2000, had his first game without a TD and threw two picks in the BCS title game vs. Oklahoma. 0 — No team has ever gone from unranked to win a BCS championship, with Auburn coming the closest in 2010 when it opened at No. 22. The Seminoles are the more complete team, with a third-ranked defense to go along with a Winston-led offense that’s fifth in the country. In fact, Florida State’s only real deficiency is in net punting, where they’re 116th largely because they’ve had an FBS-low 36 attempts. That being said, Auburn’s ability to play in and win close games could mean a lot here. The Seminoles have won by an average of 42.5 points, while six of the Tigers’ games have been decided by eight points or less. Auburn has had destiny on its side for more than a month now and it will continue with the most staggering turnaround of the BCS era.